On the drive to Medieval Times at Discover Mills up I-85 this past weekend a theme emerged: my only son was concerned about what “evil” things he might be privy to. I tried to reason out the difference between Medieval and evil but the pronunciation didn’t help Owen or Siri. He couldn’t quite grok why it wasn’t evil if there would be a “bad knight” in the mix and she couldn’t offer directions to anywhere in Lawrenceville with the name “mid evil times”. Damn my midwestern accent and my desire to teach a 4-year-old about swords & chivalry. Once we got there any questions of good & evil were quickly distilled into our own personal version of the classic camp color war. We were seated in the Blue section and proceeded to cheer for our azure champion until he lost to the yellow knight. Bummer. The best of that experience was watching Owen’s facial expressions during the melee. Due to our seating arrangement, the noisiness of the hall and the presence of Owen’s best friend I really had to struggle to make sure he was hearing my questions, eating his dinner (with his hands), behaving himself and, most of all, having fun. Luckily, I remembered I had my iPhone handy. Thank goodness for that front-facing camera. I’m an especially proud parent noting that Owen yells “Huzzah!” right after I do. Not so sure I approve of his desire to “bite” the yellow knight, but maybe if some of his moxie had rubbed off on the blue knight he wouldn’t have lost. My only other experience with Medieval Times was the film Cable Guy so it was nice to go myself without fear of a crazed Jim Carrey fighting me in melee combat. We’re definitely considering having Owen’s 5th birthday party there come July. And Owen was just the best. The above video doesn’t really do it justice. He and his buddy Lucas were in hog heaven from the very start. They’re not in the same Pre-K (but have been buddies since age 2) so this was a very special treat for both of them. 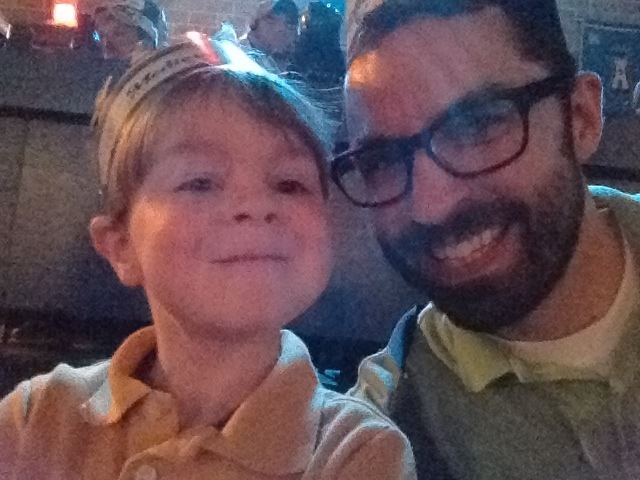 If I can scan the photo of the two of them with the “princess” during the pre-show – Owen with his foam sword and Lucas in his Viking t-shirt, both grinning ear-to-ear -I’ll post it here. Definitely one of the best father-son adventures we’ve had together, even if he still doesn’t grasp the distinction between Medieval and evil. That’s just another adventure for another day.